When McDonald’s expanded its reach in 1967 to open their first location outside of the United States, the pin on the map landed on No. 3 Road in Richmond, BC. 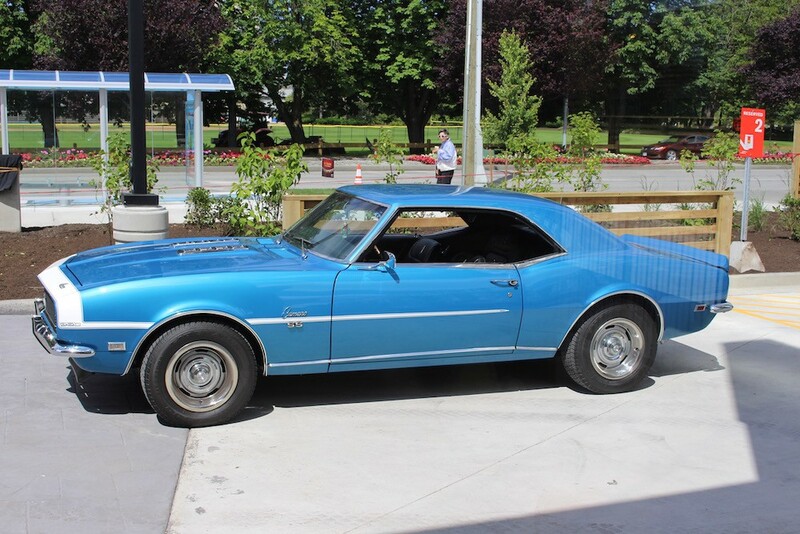 The first Canadian franchise of the burger chain may be 50 years old, but it’s never looked better, thanks to a complete rebuild. Outside the modern restaurant beckons the Golden Arches. They are the restored original from the location, and have been deemed “heritage” by Richmond. 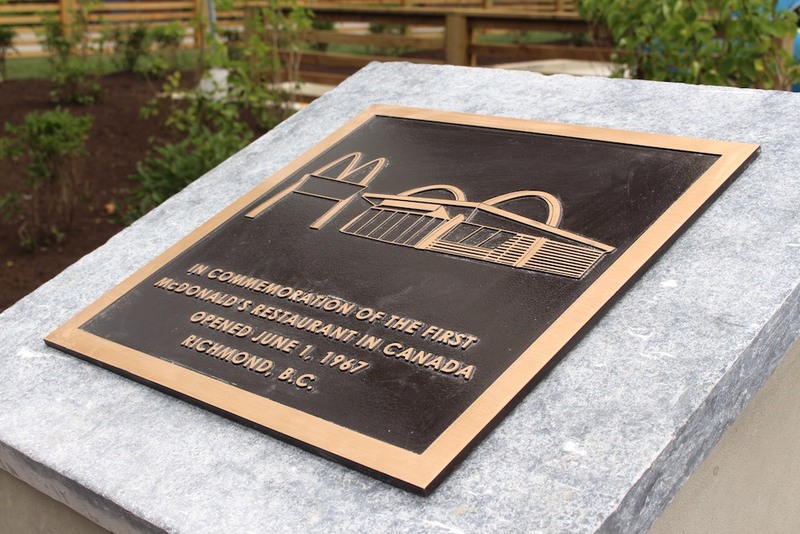 Bold, bright, and oh-so-familiar, the Golden Arches surely touch the memories for many Richmond residents, and they do so once again in front of the new building. Inside the sleek new fully-rebuilt McDonald’s is cutting edge technology and a distinct look that honours the restaurant’s past as well as focuses it solidly in the future. 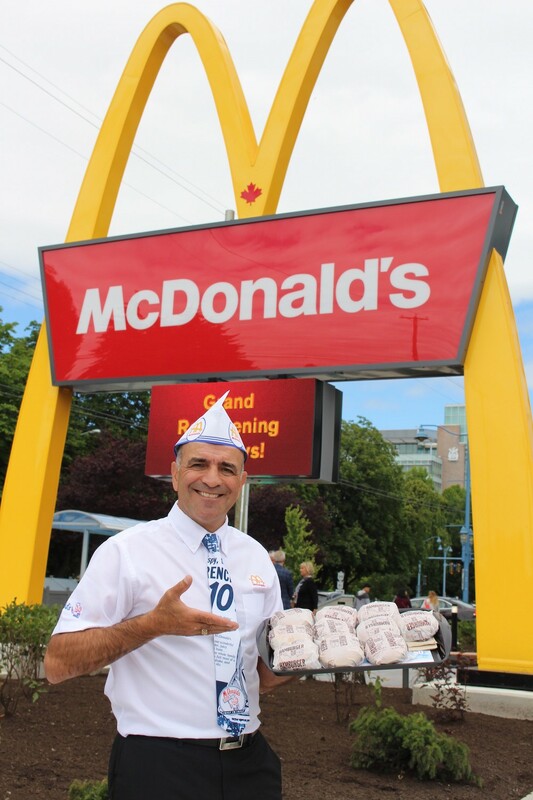 Franchisee Joe Guzzo, who has been part of the McDonald’s Canada family for 42 years, says he now proudly calls No. 3 Road “the flagship” among his locations. The timing couldn’t be better, too. 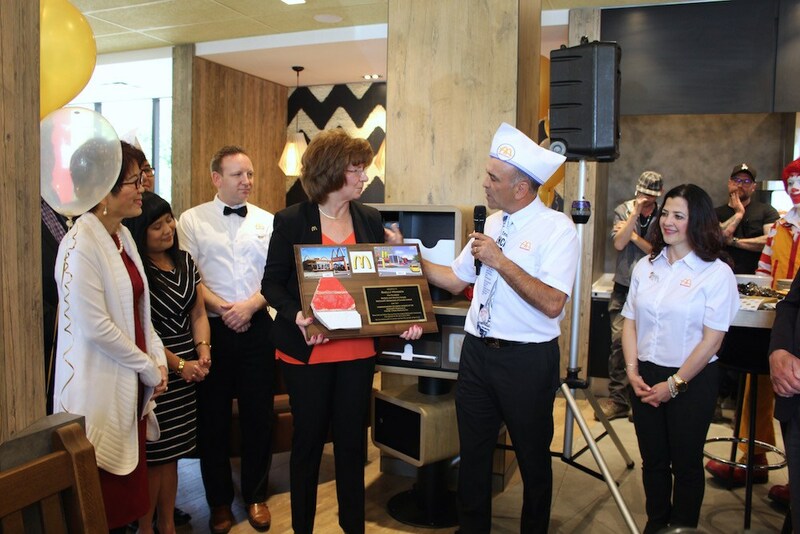 The original location opened for business on June 1, 1967, and now it will re-open on June 23, 50 years later–this time with modern wood and stone finishes, touch-screen ordering kiosks, and a McCafe Bakery. To get into the 1967 spirit, the Grand Opening day will offer the public some seriously cool throw-back vibes. 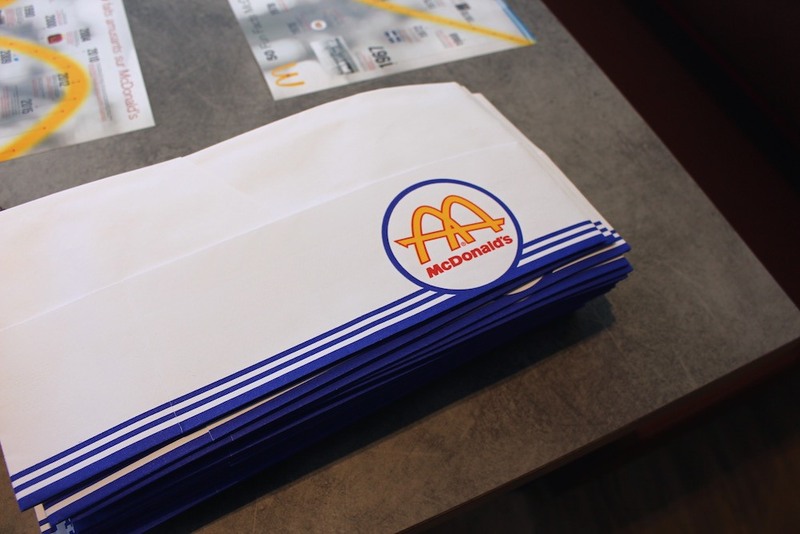 Guests at the restaurant will get to see some original McDonald’s uniforms, classic cars, historic photos, and, perhaps the most delicious part, a one-day $0.67 hamburger special. Yep, you can get a hamburger for 67 cents from 11 am to 7 pm on opening day! 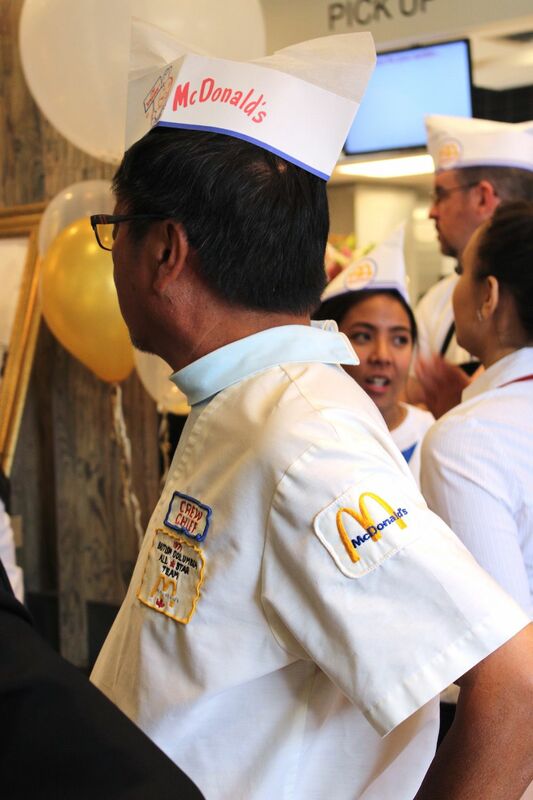 But before this very special McDonald’s location opens up, the restaurant gathered together some key players in the franchise’s unique history to pay tribute to all the hard work and dedication behind the exciting occasion. 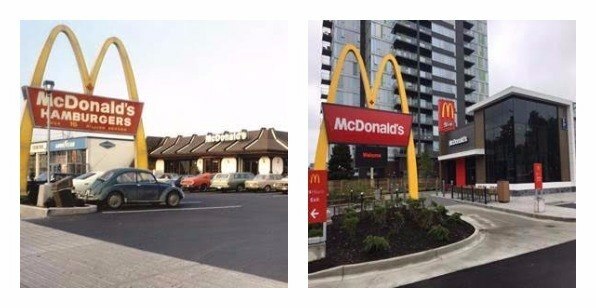 “It took a village for us to get this rebuilt,” said Shelly Hansen, Regional Vice President, Western Canada, McDonald’s Canada. 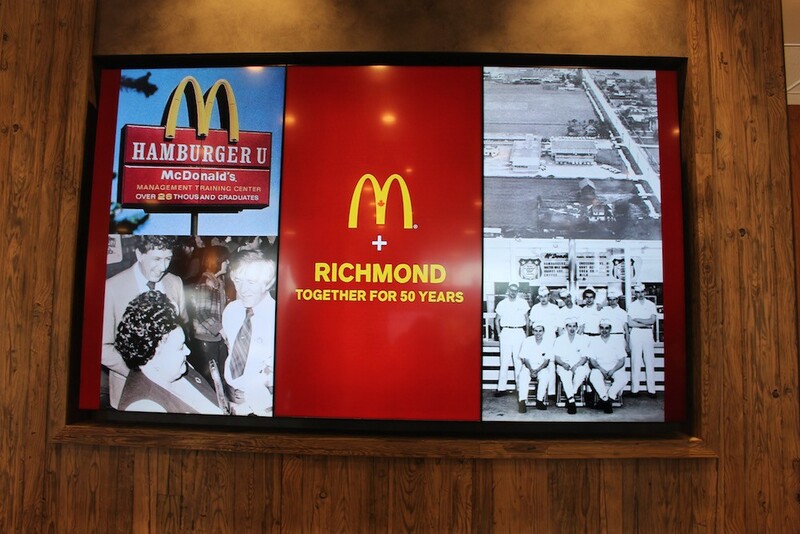 As part of the rebuild, McDonald’s worked closely with the City of Richmond, and Guzzo said the process really started about five years ago as Guzzo looked ahead to the 50th anniversary year. The then-existing restaurant was fully demolished to make way for the new one, but the process yielded a very special discovery: Original red and white tiles from the first version of the McDonald’s from 1967. In addition to pieces of the tile preserved on plaques for Hansen and the Mayor of Richmond, guests will see some of those original tiles set in concrete near the sidewalk at the front of the No. 3 Road location, along with a commemorative plaque. It’s been quite the journey at this address, along with its key players. 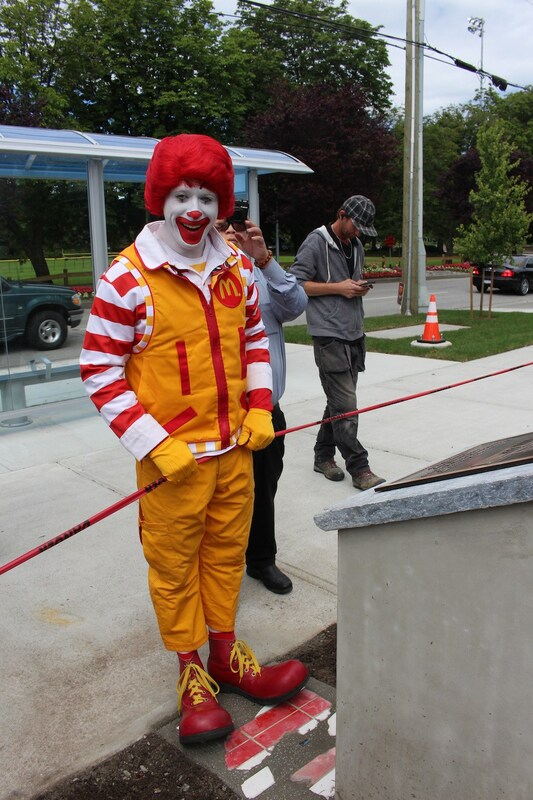 For the public, too, McDonald’s has an enduring legacy. 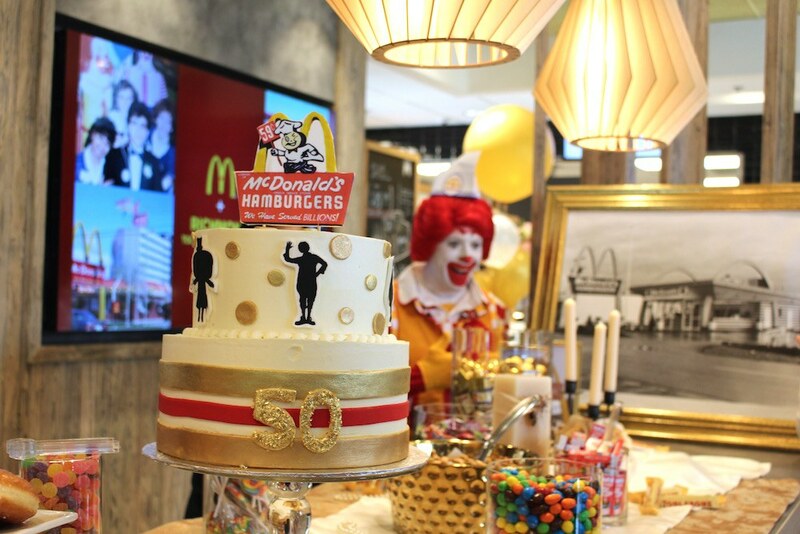 “It’s amazing how McDonald’s does play a role in people’s daily life,” remarks Guzzo, who points to anything from family meals to birthday parties and even weddings happening at the Golden Arches. 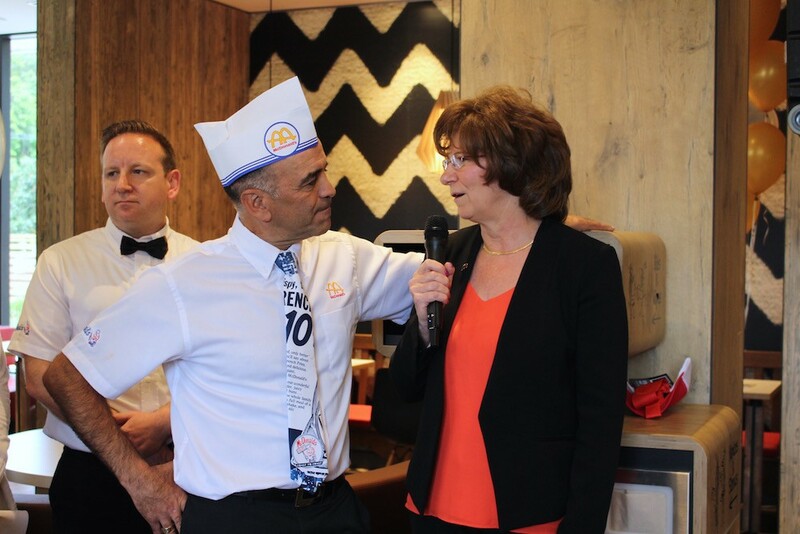 “McDonald’s is a great opportunity for people to grow, and Joe and I are a great testament to that,” Hansen adds, sharing that her toe on the ladder of her McDonald’s journey was making milkshakes 40 years ago. Guzzo started with McDonald’s 42 years ago as an employee, cleaning tables at a North Burnaby location. 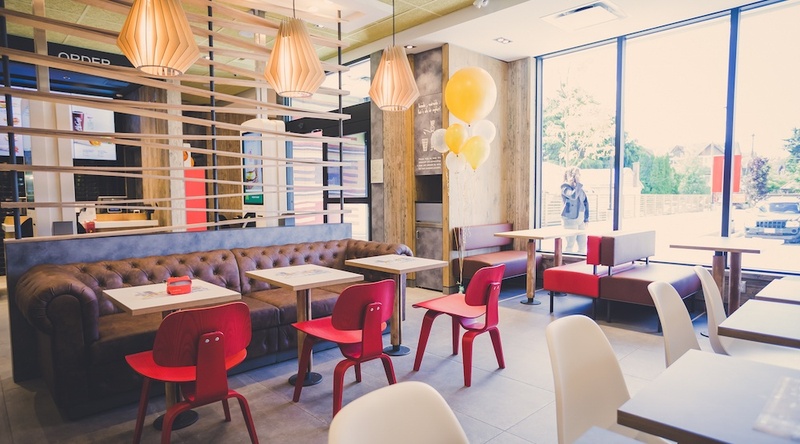 Guzzo now operates 13 McDonald’s franchises of the 197 in British Columbia. Guzzo looks back fondly on his earliest years with McDonald’s and the fun he had with his co-workers on and off the job, and is especially proud of when he first became a franchisee in 2009. Still, if we’re indulging in a look back, you might share Guzzo’s pick for a long-gone menu item he misses the most: McPizza. Guzzo acknowledges that McDonald’s is terrific at selling food and listening to their customers, so when a menu item works, it sticks around, and when it’s not selling as well as it did before, it’s time to move on. 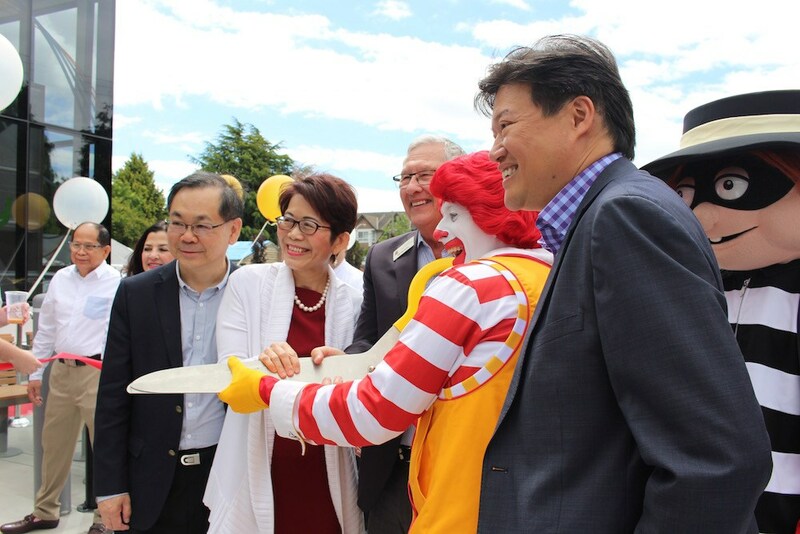 Celebrate the Grand Re-opening of McDonald’s first Canadian location at 7120 No. 3 Road in Richmond on Friday June 23.